Weakness in the European and US peers amid Chinese economic slowdown failed to calm the nerves of the investors. After a dismal opening, markets witnessed a volatile trading session with Nifty ending below the crucial level of 7,800 as the continued uncertainty over China's economic growth weighed on investor sentiment. Further, volatility is likely to continue ahead of the expiry of August F&O contracts tomorrow. 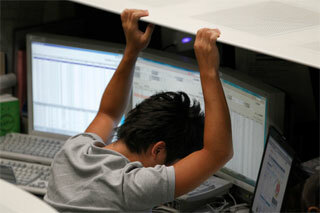 Sensex slumped 318 points to end at 25,715 levels and the Nifty lost 89 points to close at 7,792. In the broader market, BSE Midcap index slipped 0.8%. However, BSE Smallcap index climbed 0.2% and outperformed the peers. The market breadth ended flat on the BSE with 1,323 advances versus 1,344 declines. “Volatility has been on the rise for Indian markets. The indices have swung based on the movements across the globe, and I believe that this would take some more time for the markets to stabilize. The daily RSI’s of Nifty has now entered the oversold territory. This generally indicates that if the index doesn’t provide a sharp bounce in the next few days, there could be increased chance of a further correction,” said Kunal Bothra, Head – Advisory, LKP. “The breadth of the market was slightly better today, even after the last hour sell-off, hence the view would be that if index continues to take support above 7650 then stock specific approach could be useful,” he added. Shares in China ended lower amid a volatile trading session to hit fresh eight-month low as the rate cut by its central bank late Tuesday failed to boost investor investment. The benchmark Shanghai Composite ended down 1.3%. The rupee depreciated by 2 paise to 66.12 against the US dollar at the Interbank Foreign Exchange due to fresh dollar demand from importers and weakness in the local equities. On the sectoral front, BSE Bankex, IT, Capital Goods, Healthcare, FMCG and Oil & Gas indices ended lower up to 1.7%. However, BSE Metal and Power indices ended up by 1.6% and 0.2%. Car maker Tata Motors gained 1.6% on hopes that India’s cheapest auto stock may gain from China measures. China’s move to cut interest rates, reserve requirements may boost sales of unit Jaguar Land Rover. Mahindra and Mahindra dropped over 3% after the company said it plans to invest Rs.700 crore in the commercial vehicle (CV) vertical as it aims to become a full range player in the segment in the next two years. Lupin which gained in the morning trades on receiving approval from the US Food & Drug Administration for anti-inflammatory drug Diclofenac Sodium slipped 1% on profit booking. FMCG majors ITC and HUL ended 1% and 1.3% lower after IMD reported that the country as a whole, cumulative rainfall during this year's monsoon season was 11% below the Long Period Average (LPA) until 25 August 2015. Financials took a hit in today’s trade with SBI, HDFC twins, ICICI Bank and Axis Bank lost 0.1-2.5% amid slowdown in the Chinese economy. The technology stocks firmed up in today’s trade on the back of a depreciating rupee. Wipro and TCS closed 1.5% and 0.2% higher. Maruti Suzuki closed the session with marginal gains on talks of new product launch, new-generation Maruti Alto. With global crude oil prices at a six-and-a-half year low, upstream oil and gas companies like ONGC and RIL ended lower. ONGC dropped 2.7% and RIL eased 0.3%. Power Mech Projects which made its debut today ended 8% lower after listing below its issue price of Rs 640. Shares of logistics service providers such as Gati, Transport Corporation of India, Snowman Logistics and Patel Integrated Logistics ended 4% higher on reports that the government is considering reconvening Parliament to make another attempt to pass the Goods and National Sales Tax (GST).